Warning: This book could change the way you live. "Although I've experienced what it's like to get overextended, I've never been poor without options or help," writes Hagmann. "My faith tells me that being a Christian must affect who I am and how I behave with my wealth. Christ has something to say about the way I live my daily life, from how I treat others to how I spend my money." Do you make everyday economic decisions that reflect your Christian faith and values? Or are you "living large" in a material world? 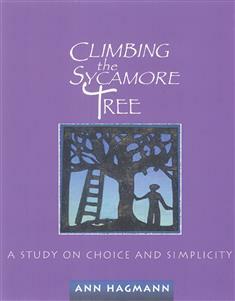 Using the story of Zacchaeus (Luke 19:1-9) as its inspiration, Climbing the Sycamore Tree is a 6-week study of faithful stewardship. Hagmann uses both scripture and consumer statistics to show how our buying habits often marginalize certain people and perpetuate systems that contradict good stewardship and love for God's creation. Following the experience of the tax collector Zacchaeus, the study seeks to deepen the link between the faith we profess and the lifestyle we live. The study is divided into three sections of two weeks each. Each week's readings consist of five lessons and a group session that includes scripture, discussion questions, guides for reflection or activity, and prayer. Open yourself to transformation that more clearly reflects the daily living of the faith you profess!